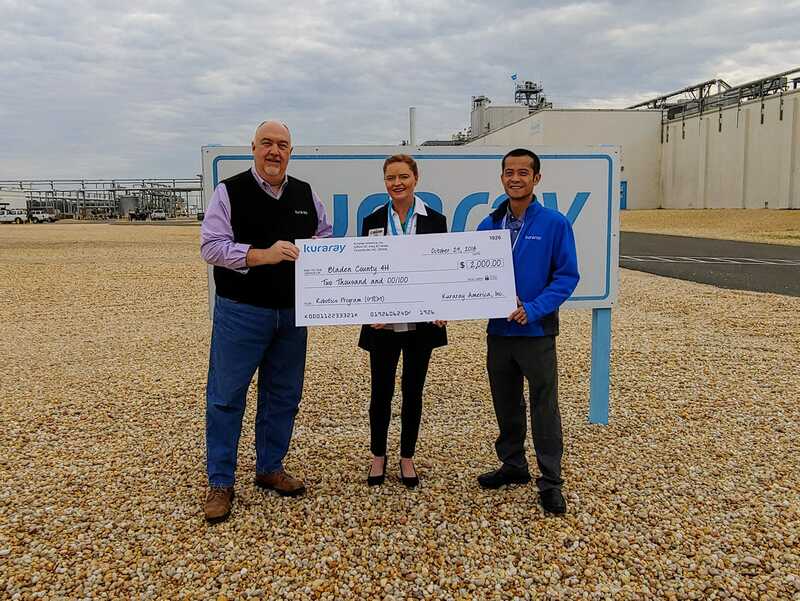 Kuraray America, Inc. donates funds for Bladen County 4-H’s Robotics STEM program. Presenting the check are Ross Crews, Plant Manager on the left and Jia He, Production Manager on the right. Stacie Kinlaw, center, is shown accepting the donation on behalf of 4-H.
“Thankful” is the best word to describe Bladen County’s 4-H agent, Stacie Kinlaw, this week as she accepted a $2000 gift to purchase equipment to enhance the 4-H Robotics educational program for youth in her county. The partnership between the generous donor, Kuraray America, Inc. and Bladen County 4-H, is mutually beneficial for both organizations. 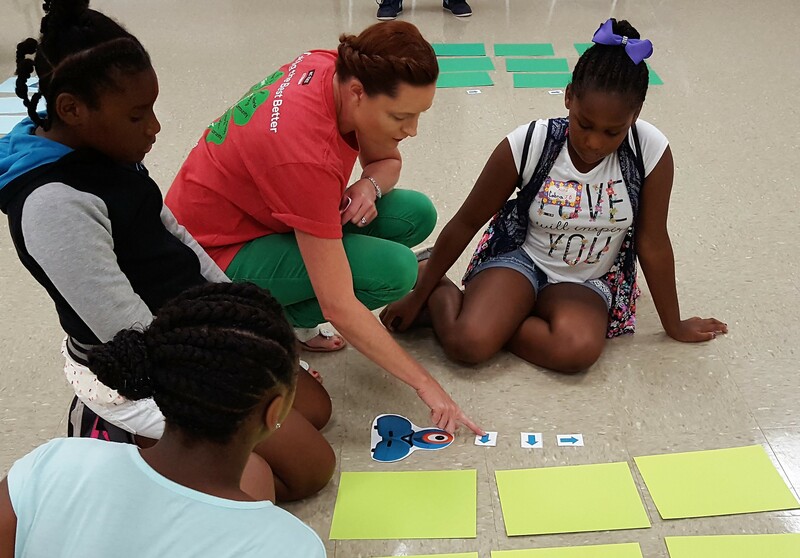 Bladen County 4-H has offered Robotics camps and workshops in the summer for the last three years with borrowed equipment and technical assistance support from NC A&T State University. Past youth participants and volunteers have expressed interest in having more access to these types of resources. This enthusiastic response from 4-H students has increased Mrs. Kinlaw’s desire to establish a more comprehensive program, including establishing a special interest club of youth that will specialize their learning and 4-H projects around robotics. In order to prepare for this 4-H Robotics expansion, Bladen County 4-H will need to invest in equipment including robotic kits and iPads to program the electronic devices. The monetary gift from Kuraray America, Inc. will provide funds to start our county’s collection of necessary equipment to host this program. 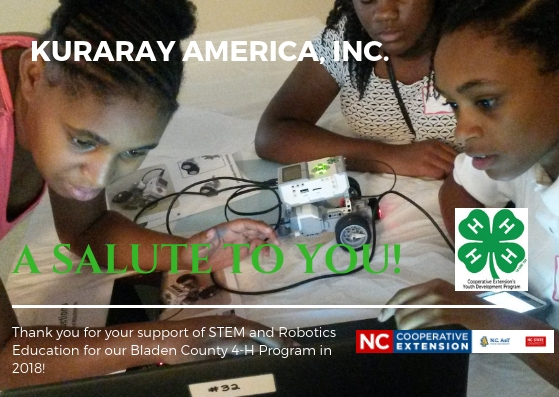 In addition, Kuraray has committed to offering volunteers to help our Bladen County 4-Hers learn about robotics through hands-on experience. Just this summer, experienced engineering staff volunteered time during the summer series offered by Bladen County 4-H, Growing 4-H: Full STEAM Ahead. “We are especially grateful for the corporate sponsorship and partnership with Kuraray America, Inc. A donation like this will help start a seed in our county, and it has the potential to grow exponentially through the youth that will use the equipment and learn from their staff.” Mrs. Kinlaw shared as an account of their appreciation and excitement for the generous gift. The 4-H program is the youth education program of North Carolina Cooperative Extension, based at North Carolina State and North Carolina A&T State universities. More than 239,000 young people between the ages of 5 and 19 participate in North Carolina 4-H activities each year with the help of 21,700 adult and youth volunteers. If you would like more information about 4-H activities, programs, and clubs in Bladen County, please contact the N.C. Cooperative Extension of Bladen County office at 910-862-4591 or Stacie_kinlaw@ncsu.edu.